When an advocate for healthcare experiences a urological condition himself, what new insights does he gain? Radboudumc REshape Center for Innovation believes in the era of the rising self-empowered patients. In your opinion, is there a link between this self-empowerment and asking for help from healthcare providers? Patient self-empowerment is in no way contradictory to seeking professional help. I think the concept is often misunderstood. The empowerment comes from being informed, being engaged and being able to understand the impact of choices to be made. When families support each other and are proactive as a loved one copes with a urological condition, that is also empowerment. Additionally, never underestimate the empowerment that stems from sense of community. When I was hospitalised for four days (I thought I would only stay overnight but there were complications), I received support from my social media community, even during the nights (as social media networks are global). That really helped me. In one of your blog posts, you’ve mentioned about virtual visits to the doctor. Would this option help encourage patients to seek medical attention? I agree that sometimes it’s necessary to be there physically such as preparations for the surgery by the anaesthesiologist, blood tests, checking the blood pressure, and other diagnostics. I also think some (follow-up) consultations with doctors or nurses can be easily done online such as via FaceTalk, a secure virtual visit that we at the Radboud university medical center (Radboudumc) have developed. This convenience can motivate patients to talk to their doctors more in a less invasive setting and without the burden of travel and taking time from work. 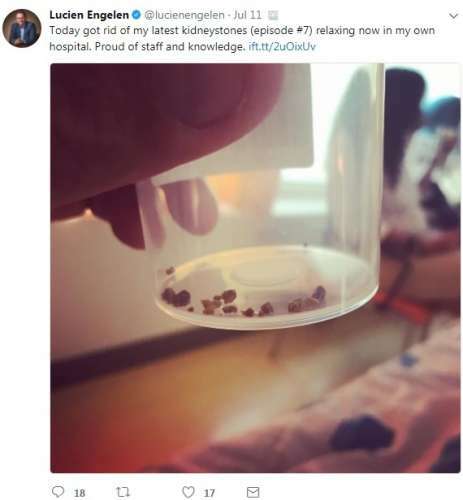 After undergoing ureterorenoscopy, are there new things you’ve learned or noticed? I realised even more how great the hospital staff is in making the experience at Radboudumc as good as possible given the circumstances. I think we tend to underestimate the role of nurses. They were my anchor during my hospitalisation. They were incredibly attentive; when things were not really OK with me, even with the small nuances, they immediately took action. In addition, we have implemented a new food-system at Radboudumc wherein varied foods in small portions were brought in throughout the day which is healthier as oppose to three full meals per day, and this also led to more socialization with the staff. I’ve learned about the importance of rest, the wonderful benefits of low noise levels (please stop wearing heels in the hospital. This also goes to the front-desk staff walking around) and the relevance of being able to reach out to people, even online. All in all, I’m proud of my colleagues. I’m glad this episode had passed and I hope if there’s a next one, that it’ll take some time to happen. Hear more of Mr. Engelen’s stories, thoughts and ideas. 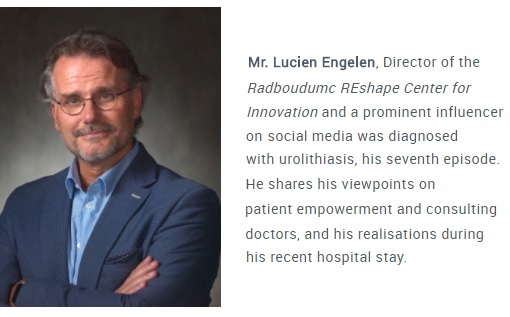 Follow him on Twitter via @lucienengelen.